Our Pulmonary Maintenance Exercise classes are for people who suffer from lung disease and would like to improve their general fitness. 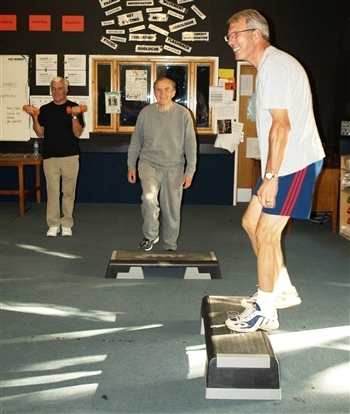 We offer safe and effective exercise led by an instructor qualified in this type of specialist exercise. The class provides the opportunity to exercise at your own pace and within your own limits, but in a friendly class atmosphere together with people with similar health conditions. Our Pulmonary Maintenance class is a weekly, circuit-style class that is not held in a gym, and which you can continue to attend for as long as you wish. Unlike other Pulmonary Maintenance exercise classes, ours is not held in a gym. You will be exercising with a small group of people who have all experienced similar health problems. At your first session, the instructor will assess your medical condition and will agree an individual exercise plan with you, taking into account the medical referral form that you bring from your GP or Pulmonary Physiotherapist. At each subsequent session, the instructor will monitor your progress and modify your exercise plan to reflect your improvements. During the class you will move around a circuit in the room, performing different exercises and using different items of equipment as you go. You work at your own pace and are encouraged to rest if you feel that you need to. If you need to bring your portable oxygen with you are welcome to do so. Each session lasts an hour, and includes warm up and cool down exercises and stretches as well as the circuits. You do not need to bring any equipment with you. We recommend that you wear clothes that are comfortable to move in, and you may prefer to wear trainers, but no special exercise clothing or footwear is necessary.